Pre-Order Swag is a Thing! Happy July friends! We are getting closer and closer to the release date for JOSIE'S LOST TOOTH, and I've got some excellent gifts for those of you who are organized enough to pre-order my book from your favorite independent bookstore or other good source. 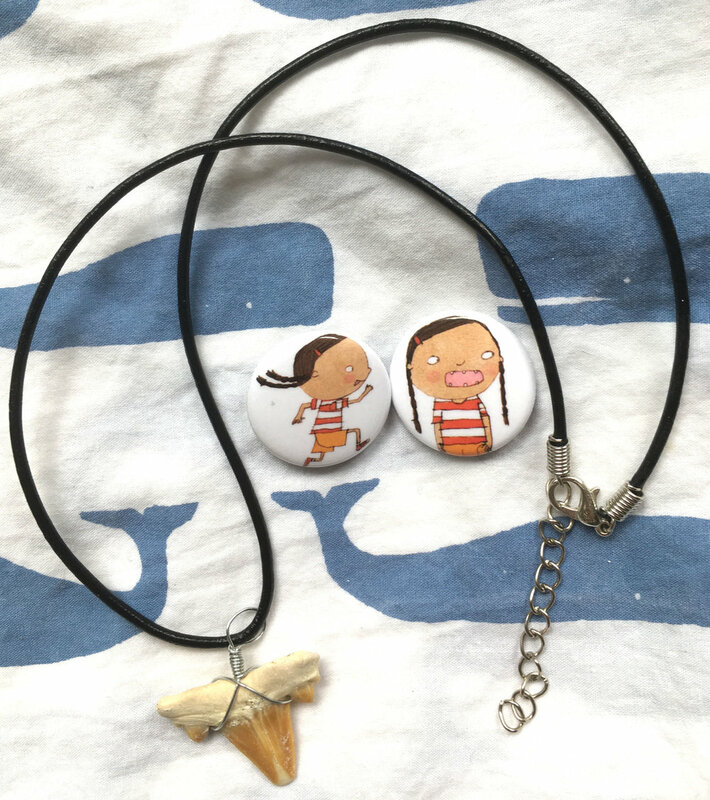 If you pre-order, and send me a note to let me know, I will send you these *RARE* Josie buttons, AND, this super cool shark's tooth necklace, just like Josie's! Your gap-toothed imp might need a shark's tooth to fill that gap! And if you order my book from Eagle Harbor Book Company, you can request that I sign it before they send it off to you. Supplies are limited, so get a move on! UPDATE: Book donations to Camp Resurreccion have been AMAZING!! Thank you to everyone who has stepped up and mailed or delivered books. We are a little light on books for younger children, especially PICTURE BOOKS, so if anyone is moved to mail a few picture books to the address below before July 1, I would be SO grateful!! I am reaching out to ask you to consider making a donation of new or gently used books for children ages 3-20, to a cause that is important to me. This summer, I will be volunteering at Camp Resurreccion, serving children of Spanish speaking farm workers in the Skagit Valley of Washington State. I will be teaching art workshops at this wonderful camp that serves kids who may otherwise be at loose ends during the summer while their parents are hard at work on area farms. I would love to be able to share your wonderful books with these kids--books for them to cherish and keep, and books to swap and share with their siblings and friends. The camp is for kids ages 3-11, but there will be many teenagers working as camp counselors who would also be thrilled to take a book home. The Skagit Valley is one of Washington's largest producers blueberries, raspberries, strawberries, tulips, daffodils, and specialty potatoes. More tulip, iris, and daffodil bulbs are produced here than in any other county in the U.S.. It's productivity is vital to our state and national economy, and it's workers are primarily latinx. “Grace Camp Resurrección 2018 is a partnership with Grace Epsicopal Church, Bainbridge Island and La Iglesia De La Resurrección Church in Mt. Vernon, WA. The mission is to bring a week long day camp to Resurrección Church, which serves Spanish speaking families who primarily work on the farms in the area. The long summer work days for parents in this community leave children without much supervision. Camp not only provides a safe place, but a fun and educational experience for the children. Teen Crew Leaders, Volunteers, and Church Staff bring art, reading, science, math, fun games, skits, music, hot meals, play, etc. to 80 children ages 3-11 for the week of July 15-20. And drop me a note, jennifer at jenniferkmann dot com, just to let me know. Have you ever lost a tooth? Then you need this book! It's my newest and it is coming out in September. It's ready for pre-order now, here. This is a book with true universal appeal, because, really, there isn't a human alive or dead who has not had a loose tooth--right? This is the story of indomitable Josie, who is the last one in her class to lose a tooth. (And she is last almost never!) Will that tooth come out without a fight? Not a chance. I hope you like it, and I promise to share more about it between now and the day it arrives in your hands. I've dreamed of appearing in the pages of the New York Times Book Review. And this year my dream came true! My picture book I WILL NEVER GET A STAR ON MRS BENSON'S BLACKBOARD was recently featured in a piece on books that help children appreciate their differences. Check it out here! If it's spring (which it almost is--hooray!) then it's time for Percy to show you the way to the dog park. Percy, Dog of Destiny, is due in bookstores on March 28, 2017. This latest project of mine was a collaboration with author Alison McGhee. Such a fun book! This was a bit of a departure for me--my last three books have all featured child protagonists, and so I had developed a pretty good comfort level conveying kids' body language and facial expressions. But Percy is a high-energy Jack Russell, and his friends are Molly the Poodle, Oatmeal Raisin Cookie the Dachshund, and Fluffy the very-oversized-Bull-Mastiff-type--so I really had to up my game and learn how to show all kinds of action and emotion for dogs as well. I loved having to figure out how to give each dog their very distinct personality, not only in how they look, but in how they comport themselves. In the end, it was impossible to pick a favorite, because all four charmed me, and they each truly took on a life of their own as I put them to work in service of Alison's lively, witty text. Time to pee on a tree! A mischievous squirrel nearly steals the show. But it's easy-going Fluffy who ultimately saves the day. Here is a cool thing: a few weeks ago I joined Julie Danielson for toast and avocado on Seven Impossible Things Before Breakfast, one of the best and favorite blogs about children's books in the whole world. No other words need be said here. Since writing SAM and JUMP, I have learned that many of my adult friends still have their original stuffed lovies. Here you will find a collection of stories about the furless, hairless, eyeless, darling and beloved stuffed animals that many of us olds still treasure and protect with our lives. What is it the magic that makes this so? "This is Paddy. He's been with me for more than 40 years. I've never, ever lost him, but your request is making me realize why I'm having a hard time with my 10-year-old daughter's suggestion that we operate on him to repair his floppy head and squashed belly. What if he's not the same ol' Paddy when he emerges from surgery? And do I really want him to be fat and sturdy and straight-eyed again? His wonky eyes and caved-in body and weak neck and - most of all - his well-kissed threadbare nose were all earned honestly." My newest picture book, SAM and JUMP, launched this week! I am so happy with it, and feeling very grateful for the love that it was shown during the entire creative process by my wonderful team at Candlewick Press. They really know how to make children's books, you know? Anyway, I have found that my story of a lost beloved stuffed animal has touched a chord with more than a few adults, and I want to share some of the stories I have heard. How do these bits of fur and fluff exert such pull on our heartstrings? So, this is Mai Mai... Who my family was delighted to notice looks a lot like jump! We brought our daughter home from foster care when she was one year old. We had given her an elephant stuffy while visiting her at her temp home before ours, and we bought three of them, hoping she would attach to that guy and we would have back-ups in case the elephant got lost. But a few months after being with us, while trying to strap her screaming and arching her back into her car seat, my husband grabbed the closest thing he could find, which was this bunny, and he was speaking for the bunny in a funny voice to distract her. From that moment on our Lia was never without the bunny who she began calling Mai Mai, a name we think was conflated with her starting to learn to say 'mama'. She teethed on him and slept with him, took him everywhere always. We moved to a new city a year later and on a rainy Night we went out to dinner, came home and realized that Mai Mai was missing. We called the restaurant, a gas station, looked for hours and all of us were crying, worried about if he was OK or scared and we just felt sick! My husband went out into the dark stormy night to search the car for the fifth time, and my daughter and I sat in the living room and cried, knowing Mai Mai was lost forever. Then suddenly, there was my husband pressing Mai Mai against the dark rain battered window! We had dropped him as we got her out of her car seat and he had fallen behind the car tire, rain soaked and muddy on the driveway. We were so giddy we cried and laughed and nearly passed out with relief! And from then on the rule was, Mai Mai NEVER leaves the house! We found a back up bunny in a different color who is called Bluey who travels...we've never lost him! When our daughter was five we brought a puppy home and I caught him with Mai Mai in his mouth, shaking him and about to rip him apart! Miraculously, I caught him just in time so there was only one small hole on Mai Mai's booty :) Our daughter was emotionally torn, as she loved the new puppy so much but she also obviously loved Mai Mai... She couldn't be mad, it wasn't the puppie's fault. We learned to keep all stuffies out of reach. I sewed a heart-shaped patch on the hole on Mai Mai's back side and it reminds us we almost lost our dear bunny twice. This is Ted. He belongs to my college-bound daughter. Teddy has been her beloved from the age of three months, and has only spent a few fraught nights away from her. But those nights away were some very dark nights, for my girl, for Ted, and for me! To a small child, the loss of a stuffy is genuinely heart breaking, because, to them, they have lost a part of themselves, or a loved one. When Ted went missing, I felt my child's pain acutely. But what was surprising to me was the depth of my own concern for the well-being of Ted. I, the adult, was worried about what Ted was experiencing, and just how profoundly lonely and cold he must be without his sweet girl. I also remembered being a child whose favorite Raggedy Ann doll spent the night at the beach, and how worried I was for her. Those feelings have stuck with me for a very long time. And so I wrote SAM and JUMP. To honor the release of my next picture book SAM and JUMP, I'm collecting stories of your (or your favorite stuffed animal or doll from your childhood, and what happened when that stuffy was lost. Please send them to me at samandjump@gmail.com, and I'll share them here with your permission. Stacks and boxes of SAM and JUMP are on their way! This is the stack of author's copies that landed on my doorstep a few days ago. The book will be available in bookstores and to ship in less than two weeks, and I am busy getting ready to celebrate! I hope that if you are in the Seattle area you can come out to one of my book launch parties and help me celebrate! Bring your beloved stuffed animal, or your stories of lost and found beloveds. There may even be cupcakes! Tuesday, May 10 (Publication Day! ), 7 pm, Secret Garden Books, Ballard Neighborhood, Seattle Secret Garden is a beautiful neighborhood bookstore dedicated to children's books. Parking is easiest to find in some of the inexpensive pay lots behind Secret Garden. Sunday, May 15, 1 pm Eagle Harbor Books, Bainbridge Island. My neighborhood bookstore! It's just a short walk from the Bainbridge Island Ferry Terminal. Make a day of it--lots of other great things to do on foot in Winslow, including a world class museum, lots of coffee and pastries, yarn, art, clothes, and of course, books! Saturday, May 29, 11 am, Green Bean Books, Alberta Neighborhood, Portland. Green Bean Books is a tiny, beautiful gem of a children's bookstore in a cool Portland neighborhood. Stay for lunch afterwards! Hope to see you! Introduce yourself if I haven't already met you. There's new stuff happening over at my picture book critique group's blog, The Whatsits, including this most recent post from me, about why I love quiet picture books. It's a lovely book launch season for SAM and JUMP! It's almost time for Sam and Jump to find it's way onto bookstore shelves, and reviews are starting to come in. It's all a little strange. And wonderful. And makes me a little teary, because I get that way. I have a new picture book coming out shortly, called Sam and Jump (Candlewick, 5/10). It's the story of a little boy named Sam and his beloved stuffed bunny named Jump. Sam loves Jump so much that they do everything together. Even at the beach, Jump is Sam's loyal companion. Sam accidentally leaves Jump behind, and realizes it when it's already too late to turn back. A long night of dark imaginings ensues for poor Sam. I remember years ago when my daughter left her beloved Ted behind on one of our many local errands. When we realized Ted was missing, we had no idea where he was, and it was too late to go looking. My mind was instantly divided into two lanes of worry--one for my poor girl who was beside herself with sorrow for her lost beloved, and the other for Ted himself, who suddenly, for me, had real emotions and could experience loneliness and despair much like my living and breathing child. What if poor Ted was lying in a ditch somewhere, unable to call for help? What if he was closed into a dark store for an entire night, and was terrified, all alone? I realized in that moment that even as an adult, I could transfer some of my own fears and sorrows onto a grubby, limp, but adorable teddy bear. And if this was eating me up, what was it doing to my sweet little girl? She did manage to sleep that night, eventually, but Ted was the first thing on her mind in the morning. We eventually located Ted, who had in fact spent a glorious night unchaperoned in our little wonderful hardware store. I can only imagine the fun he had. Thankfully, my daughter's love expanded to include other stuffed animals, and of course playmates and friends who became important in her life in new and wonderful ways. Now she is eighteen, and just so you know, Ted still occupies the place of honor--near her pillow--with his pal Elephant. They live a good safe life there. Do you have a lost Teddy story? Let me know! I do sketch from time to time. (actually, a lot) Sometimes I think my sketches have a little something that makes them worth sharing. Sometimes my sketches are so bad. I probably won't share the bad stuff here. But I will try to share some of what interests me, because I hope it will interest you. I rarely commit to public writing or drawing events, because I don't like to announce to the world that I am going to do something when I know very well that I probably won't. I feel the same way about book groups--I just am never sure I can truly commit to reading that book that we are all going to talk about next month. But, for some reason, this year I have decided to actually commit, yes, to this terrific picture book endeavor called PiBoIdMo. I, Jennifer K. Mann, will try my hardest to come up with THIRTY (maybe more) new picture book ideas before the end of November! And I am off to a good start, because just by deciding to commit (personally and publicly) the ideas have been flowing in. I'm collecting the extras up front, because there will be more than a few days this month when I may be distracted with other responsibilities. Now, you should know, there is no one checking to see that my ideas are good ones--I guess I will need to be the judge of that. I sure am hoping that there is at least one great idea among the many I hope to come up with. And even if all I have is a ton of not-so good ideas, at least I will have tried. Right? You can find lots of information about PiBoIdMoand, and inspiration from guest bloggers at Tara Lazar's blog, here. Tara has created an amazing, supportive and inspiring community of writers and illustrators all in pursuit of the elusive perfect picture book idea. You don't have to be published to jump in--you just have to want to jot down thirty ideas for possible picture books before the end of November. If I can do it, you can do it. Blogging is not dead! Not even close. In fact, I think it is on an upswing, and it is re-emerging smarter and more relevant than ever. Kind of like the picture book industry, after the last horrible recession. Take for example this new blog, The Whatsits (to which I am a contributor). It is going to be a smart blog to follow, with lots of great posts about how these terrific children's book makers do their thing: Wendy Wahman, Ben Clanton, Kevan Attebury, Elizabeth Rose Stanton and me. We are The Whatsits, friends, picture book makers, a critique group, and now a blog. I posted on The Whatsits today about my virtual mentors: those masters of the picture book form, upon whom I have relied to teach me much of what I know simply by having books out in the world. Take a look! And check back there often. I wish I could sit down and enjoy a cup of coffee with each one of you who pops in here now and then to see what I am up to. But that would be impractical, so instead I'll just catch you up right now with some of my current goings-on. First, it is now public information that my picture book Two Speckled Eggs is a finalist in the Washington State Book Awards! Other finalists include my wonderful friends George Shannon, and Jennifer Longo. The thing is, there is no shortage of wonderful books being created in the State of Washington, so this feels like an amazing and exciting honor! You can read the list of finalists in every category here. Next weekend I will be a presenter at the SCBWI Inland Northwest Annual Conference. I think there might still be a spot or two remaining if you are interested in hearing me talk about how to analyze a picture book, or if you'd like to participate in a workshop on character design. Pressure's on though--I've heard they've had a record number of illustrators register for the conference this year. This is the first time I've presented at a conference, and I am pretty dang excited about it. I do really like talking to people about kids' books! I've been noodling around with a stack of picture book ideas for my next project, and one of those ideas smacked me upside the head yesterday with a completely new twist that I actually think just might work, and that feels really exciting! (There is no feeling like it, as some of you may agree!) I pounded out the first draft yesterday afternoon, and then It disturbed my sleep--which is a very good sign. So hopefully more on that soon. My picture book critique group, The Whatsits, is about to launch an exciting new blog! We are going to have a lot of fun catching you up and filling you in on all kinds of things relating to picture books. Keep your eyes peeled for the The Whatsits, which will be launching sometime next week. Then lets see... My picture book I Will Never Get a Star on Mrs. Benson's Blackboard has garnered some very nice praise, plus mentions on kidlit podcasts and back-to-school round-ups and the like. It received a starred review from Publishers Weekly, a very sweet review from the Boston Globe, and the Wall Street Journal, a featured moment on John Schumaker's Watch Connect Read aka Mr Schu Reads, and a loving shout-out from Carter Higgins on Matthew Winner's terrific podcast, Lets Get Busy, and was part of an Amazon Editor's Picks for Back to School books. All of these, among other really nice mentions and reviews. This book means a lot to me, as you've heard me say before, so it makes me feel great that it means something to lots of other people too. That's a lot of news! It's been a fun and busy summer, and the fall is off to a really great start! I hope that's true for you too. So, today I taught a really fun workshop to a bunch of really creative kids at the Bainbridge Island branch of the Kitsap Regional Library. It was a full house, with twelve bums in chairs doing the hard work of CHARACTER DESIGN! I brought a stack of favorite books with wonderfully designed characters. I loaded up a couple of tables with a lot of collage materials and markers and glue and scissors and hole punchers and string and stuff. I talked for a minute or two about character design (clothes, hair, eyes, accessories, setting, backstory, size, shape, species, etc etc). I asked them to think of themselves as characters--human, animal, whatever they thought was right. What could they express about themselves with a drawing or a collage or both? I taught them how to use tracing paper to make patterns for cutting out collage materials to give their characters (or their settings) some, well, character! And then I let the kids get making. Their infectious creativity inspired me. And two hours was not nearly enough for all the fun we had. Blueberries taste like my childhood. My mother and stepfather lived for most of my childhood in a magical house on a hilltop covered in wild blueberries. Fresh blueberry muffins were a summertime staple in our family. I had a hankering yesterday for blueberry muffins, so I went looking in the one place that probably had just the right recipe. My mom always saved her favorite recipes by writing them in the blank pages of her favorite cookbook, or stuffing them in its pages. First it was her Joy of Cooking. Then, when it disintegrated with use, The New York Times Cookbook. I am now the keeper of that particular treasure trove, and for the first time since she died, I dug it out to look for her favorite blueberry muffin recipe. It was there as I hoped, along with a whole lot of other memories and feelings and treasured tastes. I’ve got some cooking to do this summer.